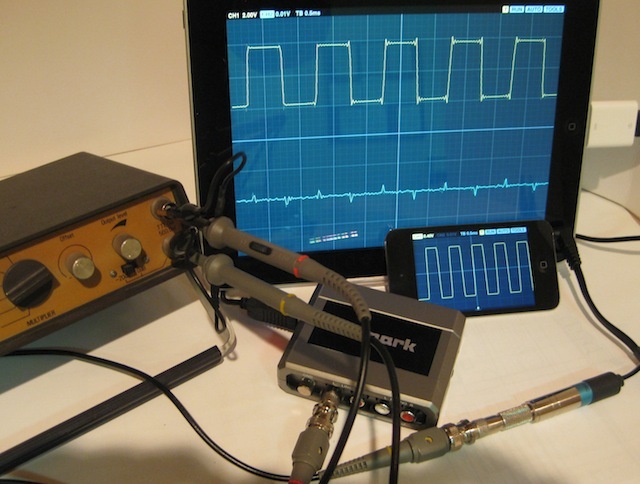 Oscilloscope for iOS is great for analyzing audio range signals, or learning oscilloscope measurement basics. The interface includes many standard oscilloscope controls, such as: triggering, time and voltage per division, signal measurement cursors, and more. For best results, we recommend using an external audio interface. This allows for standard audio equipment to be used, as well as for dual channel, unfiltered input. Some audio interfaces are Apple MFi compatible and plug directly to your iDevice dock connector. For generic USB audio interfaces, you can use the iPad Camera Connection Kit as an adapter. For feeding signals directly to the microphone jack, things get a bit complicated as the iDevice expects a particular load in order to "detect" an external microphone. To actually use the mic in, you should have a 1K resistor in parallel with the input. Alternatively you can use an adapter cable such as this one, which was apparently designed to address this. Check out Nicolai Steinkamp's article on making your own DIY audio scope probe. When connecting external signals via probes, you should take care not to exceed 1V AC voltage. The pic above illustrates some ways of attaching probes to iDevices -- using USB audio interface for the iPad and a KV Connection cable for the iPhone/iPod touch.